James Gordon was an American planter, writer, and politician from Okolona, Mississippi. He was a United States Senator for eight weeks, from December 27, 1909 to February 23, 1910. During the Civil War he was a Colonel in the Confederate Army and served in the Mississippi House of Representatives. 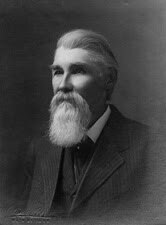 Following the death of Senator Anselm J. McLaurin, Gordon was appointed by Governor Edmond Noel on December 27, to fill the vacancy until the state legislature could elect a new U.S. Senator. The day after his appointment by Governor Noel to the United States Senate, Gordon was identified by the Memphis Press-Scimitar as a former fugitive who had been sought as a suspect in the conspiracy to assassinate President Abraham Lincoln. Until his involvement was ruled out later in 1865, Gordon was listed by the United States government as a fugitive, and a reward of $10,000 had been offered for his capture, dead or alive. Gordon had admitted that he had met with John Wilkes Booth in Montreal in March 1865, and had discussed plans to kidnap Lincoln, but denied any discussion of an assassination. Gordon served until February 23, 1910, when he was succeeded by LeRoy Percy.